This works especially well in muffins, pancakes, cookies and cakes. Inspired by the numerous awesome pumpkin recipes on here. I saw similar recipes for pumpkin muffins but not for bars, which was what I wanted. Feel free to substitute splenda for the real sugar, egg beaters for the eggs, etc. I used what I had. Also: I prefer a nice amount of spice in my bars, but reduce the cinnamon and pumpkin pie spice if you don't! If you love pumpkin pie, but hate the calories, try this! Faithfully snagged from "Vegan Cookies Invade Your Cookie Jar" from Isa Chandra Moskowitz and Terry Romero. Makes 24 chewy gooey treats. Super yummy and very light. Top with a little yogurt (whatever flavor works for you) to make it rich and creamy. This recipe is a higher-protein and -iron revision of a recipe from the cookbook: "Vegan With a Vengeance (199)," or Moskowitz and Romano's Website: www.theppk.com. 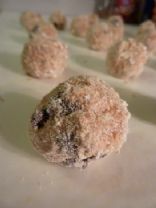 High protein-TVP and molasses has been added to add nutrition to this treat. Enjoy! This is a vegan recipe depending on the cake mix you choose. A delicious snack or quick dessert! Light and very tasty. You can vary the amount of garlic to your taste. 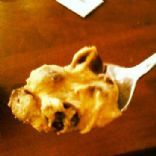 This is an easy, delicious, and healthful dessert to boost your protein intake for the day. The nutritional info I have is for the basic recipe without the chocolate chips, nuts, or fruit added. I almost always add a mix-in because they are so tasty! My 2 year old son loves them and asks for them regularly. I know this sounds weird, but it's oddly delicious. Just make sure to rinse the chickpeas well! 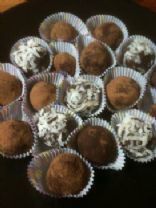 Decadent champagne truffles perfect for any special occasion, but with the added bonus of being cruelty-free. Note that these are not low in calories, fat, or anything else really. But for the (very) occasional treat, they are impressive. Yummy, super chocolatey, very easy treat. Every fourth day of the 15day Lunar cycle called Vinayaki(waxing period) and Sankashti(waning period), these are made as an offering(Prasad)for Lord Ganesha,India's favourite Elephant headed God.These are supposed to be His favourite food along with certain other stuff.Every year He is brought home and worshipped on Ganesh Chaturthi.He stays with us at home for a 36 hours(1.5 day) or 5 days or 7 days or 10 days and maximum for 21 days period.During His stay He is worshipped and feted and treated like a favourite relative. Ganapati is perhaps our (Maharastra's) best and most loved and popular Festival. The Rice flour is generally made at home by washing and drying various fragrant varieties of Rice and drying it between the folds of old Cotton Saries.They dry the Rice this way for 4-5 days till absolutely dry and then grind it to obtain this Flour. This is an AMAZING recipe that when paired with vanilla icecream is like Apple Pie A La Mode without the crust! These are also very versatile and could be paired in any combination of things - for example in oatmeal, with angel food cake. They are so simple! This fat-free pudding is easy to make and is a satisfying light desset. Try it for breakfast! For a more substantial dessert, serve pudding on pancakes or waffles. A simple recipe featuring slices of eggplant broiled, then topped wiith tomato slices on which have been placed parmesan and romano mixed with Panko bread crumbs. Yummy apple pie. Almost no fat. 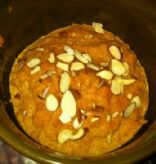 This is very treditional Indian Dessert. Lot of calories but once in while it is good.